This competition will use the Standard format, and players are allowed to use English-language cards, as well as cards from their home market in languages other than English. Players must bring their own tournament-legal 60-card deck. Players must adhere to the Tournament Rules. Masters Division and Senior Division players will begin on Friday, July 6, and compete using a two-day Swiss format followed by single-elimination rounds. The quarterfinal and semifinal matches will be played Saturday night in the Senior Division. Junior Division players will compete in Swiss rounds on Saturday, July 7, followed by a single-elimination Top 8 bracket. The finals will be played on Sunday. 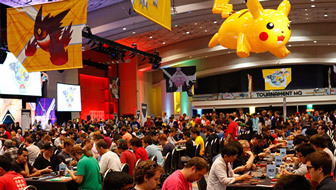 Players at the 2018 Pokémon TCG North America International Championships will be competing for Championship Points and prizes. The final Championship Point payout is determined by the number of players per age division. All participants will receive 5 Play! Points and a Pokémon International Championships promo card (while supplies last), just for playing!